The Princeton, Yale and Harvard educated author and Presbyterian minister, George Rupp, had previously presided over Rice University and served as dean of the Harvard Divinity School before accepting the presidency at Columbia. As president, Rupp took on the task of making the University’s administration more efficient and transparent. To do this, he made several non-faculty administrative appointments, including three Vice Presidents from the public sector. 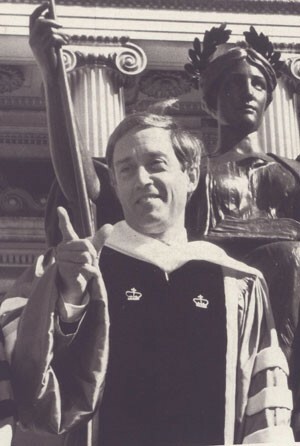 In addition, since the majority of the staff within his administration remained in place throughout his tenure, he managed to create a sense of continuity within the University. During Rupp’s presidency enrollment was expanded by twenty-five percent from 3,200 in 1993 to 4,000 in 2002. Columbia College became increasingly selective in admissions and more socially diverse than any other highly selective private college. This was helped, in part, by the founding of the Kluge Presidential Scholars Program, for students from underrepresented communities which was established at Columbia shortly after Rupp took office. During his nine-year tenure, he focused on enhancing undergraduate education, on strengthening the relationship of the campus to surrounding communities and New York City as a whole, and on increasing the university’s international orientation. At the same time, he completed both a financial restructuring of the university and a $2.84 billion fundraising campaign that achieved eight successive records in dollars raised. Following his resignation in 2002, Rupp became the president and chief executive officer and president of the International Rescue Committee (IRC).